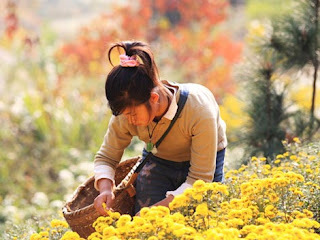 Also called Tribute Chrysanthemum of Mount Huang, or Huizhou Tribute Chrysanthemum, the Tribute Chrysanthemum is ranked among the Four Famous Chrysanthemums in China together with Hangzhou White Chrysanthemum and Chuzhou Chrysanthemum. It was a tribute to emperors in ancient China, hence the name. Growing in the vast land of Huangshan City, Anhui Province, or the ancient Huizhou, it is endowed with advantaged natural environment which nurtures the quality tisanes integrating fine color, aroma, taste and shape. Rich in both ornamental value and medicinal function, it is thus famed as a fine medicine and drink, as well as a famous specialty of Mount Huang.